More than halfway across the universe, an enormous blue star nicknamed Icarus is the farthest individual star ever seen. Normally, it would be much too faint to view, even with the world's largest telescopes. 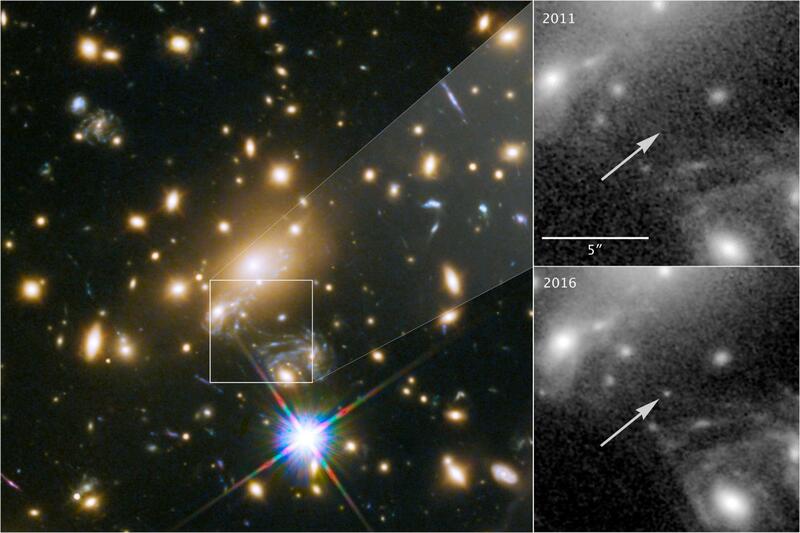 But through a quirk of nature that tremendously amplifies the star's feeble glow, astronomers using NASA's Hubble Space Telescope were able to pinpoint this faraway star and set a new distance record. They also used Icarus to test one theory of dark matter, and to probe the make-up of a foreground galaxy cluster. "This is the first time we're seeing a magnified, individual star," explained former University of California at Berkeley postdoc and study leader Patrick Kelly now of the University of Minnesota, Twin Cities. "You can see individual galaxies out there, but this star is at least 100 times farther away than the next individual star we can study, except for supernova explosions." The cosmic quirk that makes this star visible is a phenomenon called "gravitational lensing." Gravity from a foreground, massive cluster of galaxies acts as a natural lens in space, bending and amplifying light. Sometimes light from a single background object appears as multiple images. The light can be highly magnified, making extremely faint and distant objects bright enough to see. In the case of Icarus, a natural "magnifying glass" is created by a galaxy cluster called MACS J1149+2223. Located about 5 billion light-years from Earth, this massive cluster of galaxies sits between the Earth and the galaxy that contains the distant star. By combining the strength of this gravitational lens with Hubble's exquisite resolution and sensitivity, astronomers can see and study Icarus. The team – including Jose Diego of the Instituto de Física de Cantabria, Spain, and Steven Rodney of the University of South Carolina, Columbia – dubbed the star "Icarus," after the Greek mythological character who flew too near the Sun on wings of feathers and wax that melted. (Its official name is MACS J1149+2223 Lensed Star 1.) Much like Icarus, the background star had only fleeting glory as seen from Earth: It momentarily skyrocketed to 2,000 times its true brightness when temporarily magnified. Models suggest that the tremendous brightening was probably from the gravitational amplification of a star, similar in mass to the Sun, in the foreground galaxy cluster when the star moved in front of Icarus. The star's light is usually magnified by about 600 times due to the foreground cluster's mass. How did Kelly and his team know Icarus was not another supernova? "The source isn't getting hotter; it's not exploding. The light is just being magnified," said Kelly. "And that's what you expect from gravitational lensing." Detecting the amplification of a single, pinpoint background star provided a unique opportunity to test the nature of dark matter in the cluster. Dark matter is an invisible material that makes up most of the universe's mass. By probing what's floating around in the foreground cluster, scientists were able to test one theory that dark matter might be made up mostly of a huge number of primordial black holes formed in the birth of the universe with masses tens of times larger than the Sun. The results of this unique test disfavor that hypothesis, because light fluctuations from the background star, monitored with Hubble for 13 years, would have looked different if there were a swarm of intervening black holes.